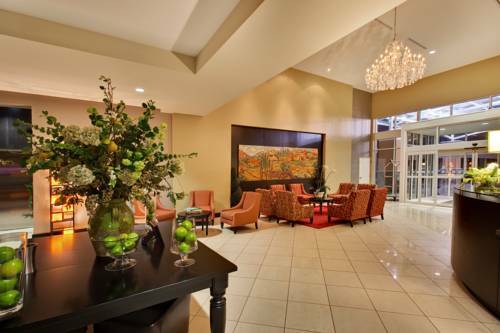 Des Moines, Iowa hotel offers comfort and convenience. Our Holiday Inn & Suites West Des Moines-Jordan Creek offers business and leisure travelers a comfortable stay with premium amenities at an affordable cost. This hotel is near the Des Moines International Airport and conveniently situated off Interstate 35, making our choice Des Moines, Iowa accommodations perfectly located for all types of travelers. Corporate travelers can benefit from the close proximity of our Des Moines hotel to many nearby businesses, including Athene, Wells Fargo, Principal Financial, Farm Bureau and Pioneer Dupont. Our hotel features four flexible meeting rooms that can be arranged in a variety of styles to accommodate any corporate event. Our non smoking Des Moines hotel offers easy access to many of Iowa's best attractions, including Living History Farm, Wells Fargo Arena, Adventureland Park and the Prairie Meadows Racetrack and Casino. Valley Junction, Des Moines Art Center and Raccoon River Park are also nearby. While lodging in Des Moines, hotel guests can take advantage of the special amenities that our family friendly accommodations have to offer, including an indoor pool, undercounter refrigerators in every room, a convenience store and our own restaurant, Johnny's Italian Steakhouse. Johnny's serves breakfast, lunch and dinner, and offers a full service bar. Be our guest at Holiday Inn and Suites, and enjoy our great Des Moines hotel rooms. Johnny's Italian Steakhouse: Offers a full-service bar. Spend the evening sipping your favorite cocktail while you unwind and enjoy the relaxing atmosphere. Grand Ballroom: Grand Ballroom can be divided into three meeting rooms. Catering presented exclusively by Johnny's Italian Steakhouse. The Container StoreChain retailer specializing in storage & organization supplies, including closet & shelving systems. Glenn Oaks Country ClubGlen Oaks Country Club has quickly been recognized as the premier club in the state. Our food, products and service are regarded as superb, and our golf course is quickly becoming recognized on a national scale. The Legacy Golf ClubNestled within beautiful central Iowa rolling terrain, our well manicured public golf course is designed to attract golfers of all abilities. Jordan Creek MallIowa's largest mall and Des Moines premier dining, entertainment and shopping experience. Ron Pearson CenterWhether you are planning a simple business meeting, cocktail party, lavish company-wide employee recognition dinner or an elaborate wedding celebration, the Hy-Vee Conference Center can accommodate all your needs! Des Moines Art CenterThe Des Moines Art Center engages diverse local and international audiences with the art of today through its museum and school, adding to the cultural record through collections and programs. Principal ParkPrincipal Park continues to rate as one of the top minor league facilities in the country. The stadium, which was built prior to the start of the 1992 season, has seen over seven million fans pass though its gates.